Cactaceae. Zones 7-11. 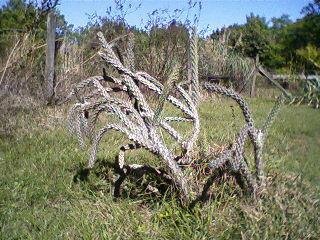 This is one of the cylindropuntias, which means that it has round stems as opposed to flat pads, segmented, and can grow to 15 feet tall. Quite well armed and potentially dangerous, but nonetheless, very attractive. Blooms range from maroon to yellow-orange. Like all cacti, it needs a well-drained, sunny exposure.